Mitsubishi Outlander Review: The great thing about competition is that it forces people to improve what they're doing. If the New Orleans Saints spent all season playing dinky high-school teams, would they have been able to win the Super Bowl? Probably not. If the Yankees only faced Little League pitchers, would they be any good in the postseason? No way. That's why it's so much fun to watch what's happening to mid-size crossover vehicles. A decade ago, crossovers barely registered a blip on the automakers' radar screen, but today they've become the de facto family car for a generation of Americans. Our grandparents had their sedans. Our parents had their station wagons and minivans. Now we have our crossovers, and they're getting better all the time. 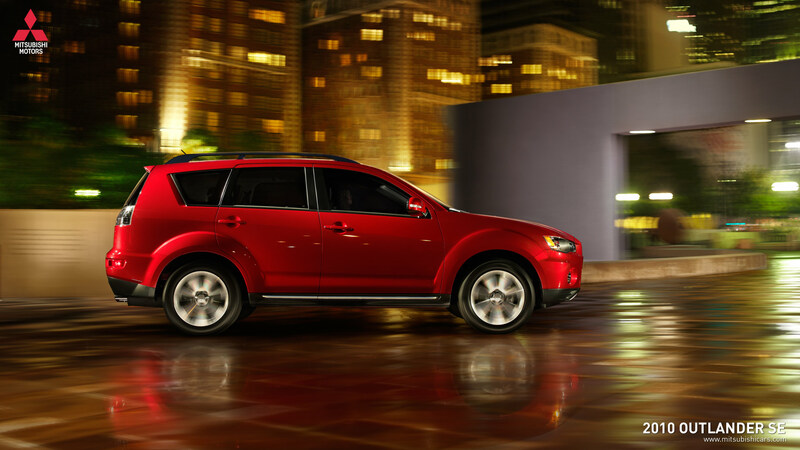 Crossover vehicles have become so popular that virtually every auto company makes one. Some companies have an entire lineup of crossovers to pick from, so they're available in every flavor imaginable, from the sporty Porsches and BMWs, to the luxurious Lexuses and Cadillacs, to the zippy Mazdas and hefty GMCs. If a crossover wants to stand out in this market, it has to do an amazing job. That's why it's encouraging to see what Mitsubishi has done with its latest Outlander crossover vehicle. In a market flooded with cars all trying to do the same thing, the Outlander exhibits a certain spunkiness that sets it apart from the pack. For starters, there's the way it looks. It's got a front end that's almost spaceship-like with rounded, smoothed-off corners and a gaping air intake that looks like it wants to eat you. Will everybody like the styling? No. It's polarizing, but that's part of what makes it so appealing. It's wonderfully bold, almost vulgar, and doesn't look like a car that was designed by focus groups and committees to give it a PG-13 rating. It flaunts its full-frontal nose. That also means it's not even remotely truck-like. While some crossovers enjoy dressing up like G.I. Joe, the Outlander embraces its softer, car-based roots. The ride is whipped-cream soft, all airy and light. That doesn't mean it's bouncy, which can be a problem on some crossovers, especially the bigger ones, but more of a suspension that ice skates over the pavement with precision and snap. It's a wonderfully crisp feeling car. The feeling that makes it fun to drive is surprising considering the Outlander is available with a third-row seat. Most crossovers that are this fun don't come with a third row. And most crossovers with a third row aren't nearly this zippy. That back-row seat isn't really a full-time, full-size type of seat, though. It's a small, lightweight, foldaway seat that's best for those rare occasions when you need the capacity for carrying 2 extra bottoms. If you carry more than five people on a regular basis, you'd be better off getting something with more room for passengers and cargo. The middle row is spacious enough for adults to ride in reasonable comfort, and the front seats are generously spaced. Inside, the Outlander feels bigger than it is. It also feels nicer than you'd expect from something in this price class. The base price is just $21,620, a real bargain, and you can get in a loaded V6 model for just over $30,000. With the right options, such as navigation, leather and a sound-pumping Rockford Fosgate stereo upgrade, the Outlander feels as sumptuous as an entry-level luxury car. It seems to have some Acura DNA, which is a serious compliment. That luxury ambiance is helped by a good quality interior with soft materials. The interior styling is spunky, just like the car's personality, but not so much that it draws too much attention to itself. It's just a good, clean, contemporary design. Assuming you like the nose, the Outlander could be a good pick. It's carved out a micro-niche for people who like their crossovers fun to drive, interesting to look at, and just a tiny bit outlandish. What was tested? The 2010 Mitsubishi Outlander 3.0 GT S-AWC with a base price of $29,250. Options on the test car included the Premium navigation system and the leather package for $3,000. The total MSRP price as tested, including the $740 destination charge, came to $32,990. Why avoid it? Not everyone likes the hungry shark face. Why buy it? If you want a crossover SUV with aggressive styling and a light, fun-to-drive feeling, buy a 2010 Mitsubishi Outlander. The Bottom Line: The bold, fun, 2010 Outlander carves a niche in the market with Mitsubishi's spunky crossover. It has a bold front end, with a gaping air intake that not everyone will like as it's a polarizing design, but it helps the Outlander stand out in a crowded field. With a starting price of only $21,620, the Outlander feels more upscale than its bargain basement priced competitors. And it's even available with a third-row seat, albeit a small one.